Books, libraries, and newspapers have at last become things of the past. Now handheld Memes allow for constant communication and entertainment. They can even anticipate our needs, dialing the doctor before we know we’re sick, or prompting us with words we can’t recall. Yet a few dedicated wordsmiths are still laboring on the final print edition of the North American Dictionary of the English Language. But one evening, right before it’s released, Anana Johnson finds that the chief editor—her father—has vanished. In alternating points of view, Anana and her bookish colleague Bart follow their only clue, the word ALICE, down the proverbial rabbit hole, into subterranean passages, the stacks of the Mercantile Library, and secret meetings of an anti-Meme underground resistance, racing closer to the truth about Anana’s father’s disappearance, and discovering a frightening connection to the growing “word flu” pandemic. Alena Graedon was born in Durham, North Carolina, and is a graduate of Brown University and Columbia’s MFA program. She has worked at Knopf and PEN and taught at Columbia. 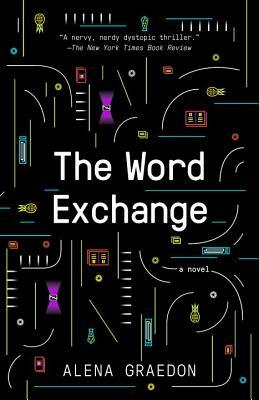 The Word Exchange, her first novel, was completed with the help of fellowships at several artist colonies. It has been translated into eight languages. She lives in Brooklyn, New York.